FISH AGILITY, YES! with Fish Agility Equipment like Tunnels, Weave Poles, Limbo Poles and other cute props. Goldfish, Betta Fish, Oscars, and other aquarium or bowl fish, doing Agility Equipment made just for them! Fish can also learn to do tricks and play Basket Ball, Soccer, and a few other sports, again, of course, with Special Equipment made for them and safe for their water. Training Aquarium or Bowl Fish is not new. Like Solomon said way back in the Old Testament, "Nothing new under the sun." Fish training just got fun and popular again. 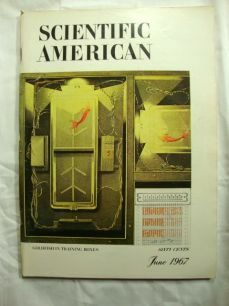 Here is a photo of a magazine I bought Scientific American Magazine JUNE 1967 Goldfish training. How did I get "into" Fish Agility? Well, have already trained dogs, goats, pet rats, mice, gerbils, hamsters and guinea pigs to enjoy little Agility Courses. It is fun for myself as well as the animals. They love the attention and the treats it brings them. I have trained animals since I was a little kid. The first animal I ever trained to do tricks I was about 6 years old, and it was a chicken, a Buff Colored Bantum Hen. I have been training animals ever since. I used to have goldfish that would not only follow my finger around the tank but also follow me when I walked by. Not everyone, just me. My brother, years ago, before it was popular to train Oscars had a couple that played ball with him. He used a Ping Pong Balls. I can not remember what else they did, but I know they knew him when he came into the room. If you have ever been to a park that has fish ponds where you can feed them out of the machines that are like gumball machines but have Fish Food in them, you will remember that the fish heard the machine and came to see you. Fish are/can be intelligent. To the best of my knowledge the most popular fish breeds to train are Oscars, Goldfish, and Bettas. Male Betta fish are usually kept alone in a bowl so they are more focused when training. They are not distracted by other fish around them. a new lady was talking about training her Betta Fish. My Betta died the Spring before and I had been thinking of buying a new one. Her talking about training her's just gave me that little push I needed. 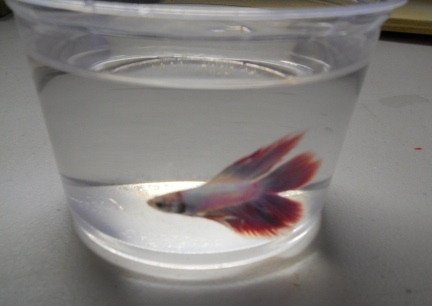 I bought a Pink/Lilac/Turquoise colored male Crown Tail Betta and named him King Fredrick. Training began the next day. If you are training or would like to train your own Small Pets or Fish, we would LOVE to have you join us at the Yahoo Groups site, just click on the box above. It is a great group of people with a lot of small pet keeping and training knowledge. A few years ago Deron was sure I would start training a Goldfish I had. He offered to buy training items and the website www.FishAgility.com Well, as a surprise, he bought the domain name for me. All of my life I have tried to encourage others to train, work with, and form a bond with their own animals/pets. I think it is important for the animals and the humans. So I have several websites with information from my own experiences on how to train their pets. Deron and I have trained all sorts of animals and not having equipment has never been a problem, actually a plus for us. We have made and sold our training aids and fun ideas for pet items for years. I have some fun ideas to make for fish equipment if this all goes well. I took a ballpoint pen apart and used the shaft to feed King Fredrick. At first he was afraid, of course, but did come and get the food. So we begin. I figure this is all I will be doing for at least a week and will wait to see if I can get him to move to where I place it and how quickly he catches on to that. The second day with the pen shaft went very well, in fact better then expected. I thought there would be more fish training advise on the Internet. What I found written was just "no duh" stuff and the writer bored me, aggravated me, with her "cutsie crap writing" and no real training content. Then another guy that was all sell, sell, sell his products to you so that you too can/could train your own fish. Nothing about really out there on actually training the fish. But let's face it. Training a fish or a rat or a dog, not rocket science.....even thought there are those that want you to believe it is so. And really, training any animal, even humans, pretty much the same. This photo of King Fredrick is not great, but I still wanted to show him off. In the photo his tail is not "open" and it is a shame, his tail is really pretty. Let me add for those that jump to conclusions, this is the container he came home in. Not the bowl he lives in. First you must have a fish. It is best if the fish is alone in the aquarium or with one other fish you will also be working with. You will need something go feed the fish out of. I have said above I use an empty ballpoint pen shaft to feed my Betta Fish out of. Once your fish has learned all about the feeding tube, or call it the target stick, you can then train it to come through a hoop. Coming Through a Hoop for small animals and or fish is a real good trick to start with. It teaches the fish to learn to learn. The idea is to teach the fish it needs to preform a task, or we call it, learn a trick. Once the fish learns you want it to do something, teaching the next task or call it trick, is easier and will take less time for the fish to learn. To train a fish you must take it slow and be patient. You must have a plan, ideas of what types of tricks you want to train, and little props that are not only safe for the fish to use, but also safe for the water it lives in. Do NOT push, pull, or otherwise shove your fish through a trick or an agility equipment piece. Not only will the fish not learn, this is abuse. It is not funny, cute or exceptable. Imagine if you were that fish. Be sure to take photos and videos of your fish. Not only will people not believe you when you tell them that your fish does Tricks and or Agility, you will want those photos and videos in the future to smile back at.